In a few days, I will be getting my first bite of a new freeze-dried raw food – TruDog Feed Me Beef. This post is sponsored by TruDog. I am being compensated to spread the word about their freeze-dried raw meat superfoods for dogs but Oz the Terrier only shares information we feel is relevant to our readers. TruDog is not responsible for the content of this article. TruDog Raw Meat Superfood for Dogs is a PREY model freeze-dried food, meaning it does not contain any fruits and vegetables. The raw meat, organs, bone and blood are freeze-dried into pellets, which is something we haven’t seen before in other freeze-dried raw (though it is possible we missed something). TruDog formulas are made using fresh, high-quality, U.S.A. raised raw meat and the formulas contain no fillers, additives, artificial preservatives, and no rendered or meal products. 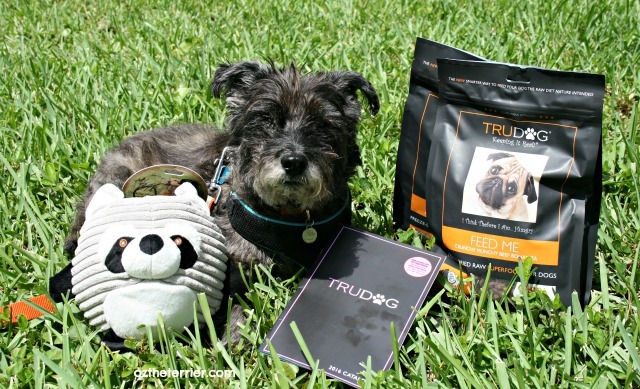 From the ingredient list, TruDog reads as a very healthy freeze-dried food for dogs and we cannot wait to try it. If you are drooling to know more, look for our post mid-July where we will go into more detail about TruDog Feed Me Beef. Until then, you can learn more at the TruDog website or by following their Facebook, Twitter and Instagram accounts. We bet that will be delicious! hhmmm pellets. does that mean you don't have to reconstitute it?? Sounds pretty yummy looking forward to hear what you say in July. Prey model pellets? That's like convenience and prey model all in one. It's great to see there are more options for people to try raw goodness! You make it sound yummy but we've never liked any freeze dried foods we've tried before. Maybe kitty foods are different. Mommy sure wishes we liked it though but nope, we just don't. OMD! We are drooling all over Mom's keyboard! We can hardly wait for more info. Sounds pretty tasty, Oz. Do they make cat food too?? I just bought some TruDog for my pups I really hope they like it. That sounds amazing to me, Mom says it sounds a bit disgusting. Can't wait to get your opinion. Did they send you a new cute little friend too? We look forward to hearing how you like this food! Sounds yummy. Can't wait to hear more.